WordPress theme can be in different styles. Everyone don’t choose the same theme. Differences in choice is a common habit of people. Like that some people want their WordPress theme where there is a side menu. Ultimately the sidebar menu WordPress website is more comfortable than the top menu. You must get what we are representing in this post. A bunch of side vertical menu WordPress theme is gathered here. People of different professions can have a look on every theme. We have gathered different types of themes as different kinds of visitors are visiting here. Here most of the themes are the most popular and top-rated theme at the present time. The themes are giving many advantages and all of them are retina ready and fully responsive. Maximum of them let you create a shop page. Almost all of them are giving premium plugins advantages. You can save extra expenses choosing themes from our posts. So take a look at Our collection Best WordPress Themes WIth Side Menu. Hope you will get the best one for you. Good luck. 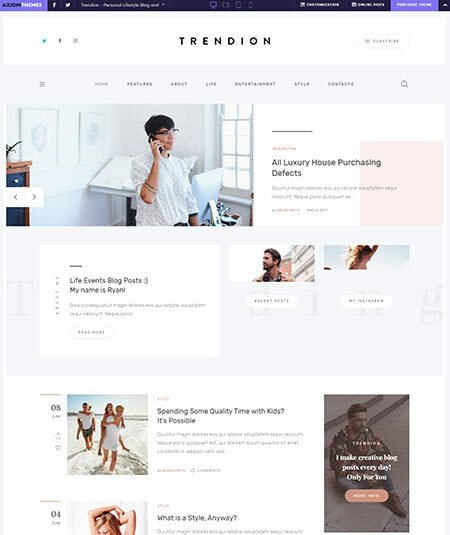 Trendion is a good solution for the online journal and bloggers who are looking for a magazine WordPress theme for their personal website. The theme is built up with a gorgeous design. At present mobile is using for everything. The theme is designed also for mobile and retina ready. As no coding knowledge is required the theme is really so easy to customize. The theme is also SEO optimized. One of the most powerful drag and drop page builder is available in the theme. There are two homepage layout and just a single click is needed to install them as there is one click demo installing system available. 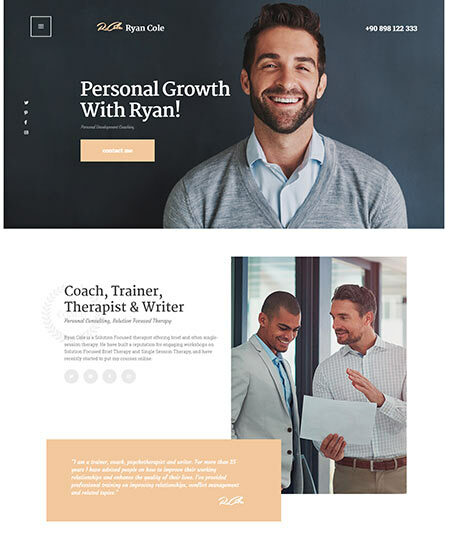 R.Cole comes with a beautiful life and coaching wordpress theme especially for business advisors, financial firms, writes etc. It’s also a perfect theme for a corporate website. Now it’s a big fact that a website is suitable for every platform or not. R.Cole is suitable for every type of displays as this vertical menu wordpress theme is retina ready and fully responsive. So you don’t have to worry about the visitors that where are they to visit this left sidebar wordpress theme. Most of the people aren’t home with coding. So this theme let you run this theme without having any coding knowledge. Lots of google fonts are also there for the user. One click demo installation system saves the extra time. This wordpress themes with side menu supports the most wanted premium plugins and providing for free. A good combination of easy and attractive features have also made the theme more popular. So, one can get the best theme and it’s R.Cole. 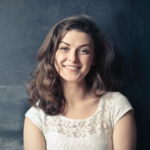 A.Williams comes for the people who provide administrative support and secretaries. The theme is also for a corporate site and also a good one for the advisors, assistants or managers. People don’t want to waste time on installation. So one click installation system gave this solution. As there is no coding knowledge is required so it’s really easy to customize the theme. 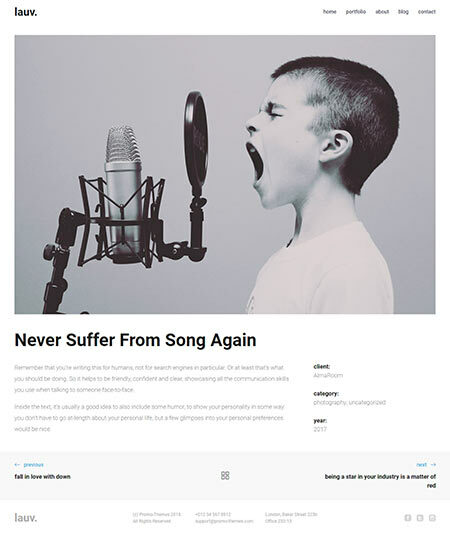 This is a wordpress theme with a side menu. This left sidebar wordpress theme has 2 homepages layouts and both of them are really awesome. Auto update system is ready on the theme. Google map and lots of google font are also available in the theme. A.Williams has a cool supporting team who are always ready to assist you. Powerful theme framework and advanced blog setting feature also make it smoother for the user. So don’t think much to choose this one. For all trendy healthy lifestyle people and sportsmen or coaches, Niobe comes with a great sports theme for them. Regular auto update is available on the theme. This left sidebar wordpress theme also supports multi languages. A sportsman is always aware of sports product and a reliable one to buy from him. Woocommerce plugin let the users to build a shop page where users can sell different types of products. The theme is suitable for all types of displays. Most of the popular browses support the theme. Google map and lots of google fonts are included to the theme. Many useful shortcodes are also added to the theme. The powerful admin panel has made the theme easier. It’s very easy to customize the theme. Many interesting and attractive features are provided by the theme. So the sportsmen should have a try on niobi having this advantages. 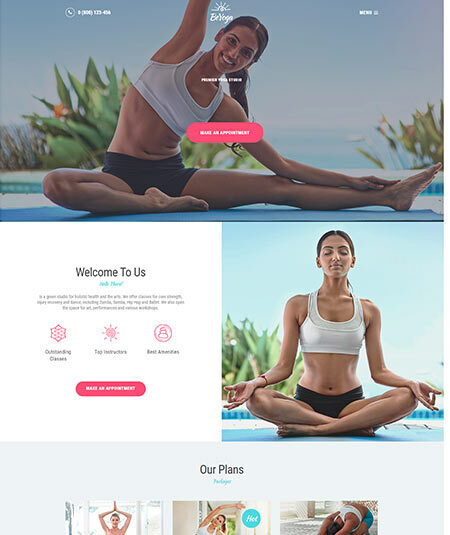 Beyoga is a beautiful wordpress theme for a yoga or gym instructor about their health tips website. This side menu wordpress theme is a great designed theme which perfectly works on any sorts of devices. The visitors are always attracted to an online shop. Woocommerce plugins let you create a shop page. Various kings of yoga dress and gym instruments can be sold and you can also run a business. 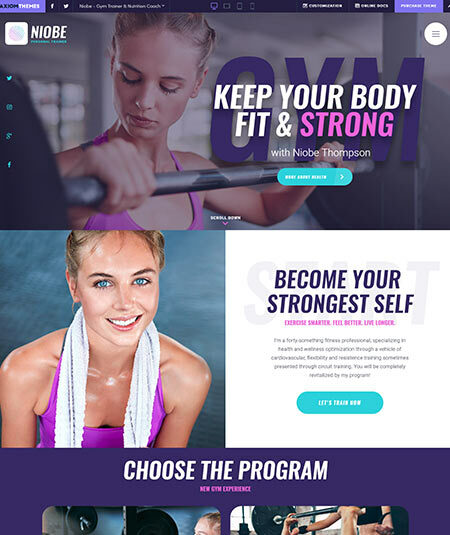 HTML5 and CSS3 code are used for building up this theme. They have a great supporting team for the users. Besides they provide a good update. Don’t look back to another theme, BeYoga is undoubtedly a cool theme. 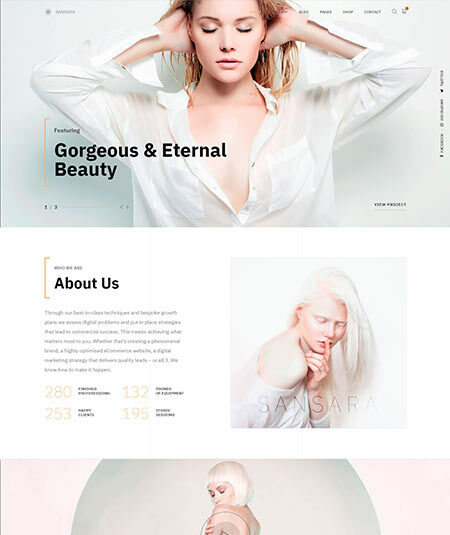 Sansara is one of the most attractive and well-designed photography wordpress themes for a professional photographer. The theme is ultra-gorgeous and really a good looking theme. Not every theme gives a big number of photography features where this theme is providing 18 photography features. About 16 homepage variation is available and one click demo installation system is available on the theme. The most wanted plugins along with some premium plugins are available in this theme. They have saved the extra expense of the user. The theme also supports Youtube and vimeo. Instagram feed is also available. This is a wordpress theme with vertical menu bar. Woocommerce plugins let you set up a shop page. Selling various products one can be benefitted using this theme. The professional helping team is already ready for you in your any problem. So no more word. Just get Sansara if you are a photographer. 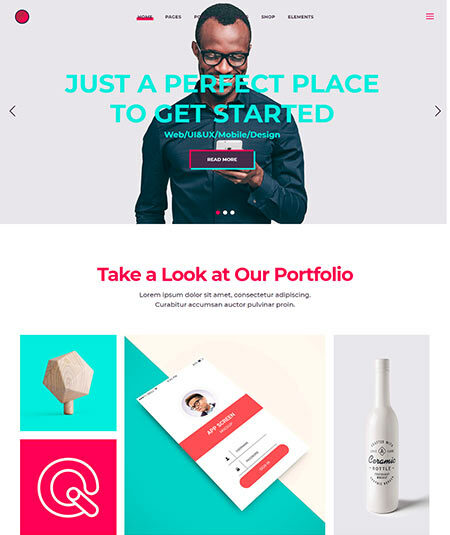 Lavr is an amazing wordpress theme for creative portfolio. The theme is a very fast one and very easy to customize. Left menu portfolio is also available. It’s a wordpress theme with vertical menu bar. The left menu wordpress theme is built with CSS3 and HTML 5 valid code. There is 16 pre made homepages and it’s very easy to install the demos. The theme saves the extra time of the users. There are very few horizontal wordpress themes with horizontal galleries. It is one of them. Woocommerce system is very attractive for any theme as using this one can build up a shop page and sell various products on their website. Most wanted features are also added to the theme such as visual composer, contact form 7, promo theme, retina ready and others. Besides this left menu wordpress theme gives a good guidance to all the users. So you don’t have to think much where there is Lavr. Someone involved with agencies and freelancer can have the perfect wordpress theme to run their business is Cortex. It’s very easy to setup the theme with its powerful admin panel feature. No one likes wasting time or long term setup process. That’s why they attached one click demo installation for their 17 pre-made attractive home pages. The theme is well SEO optimized as well. Mobile is a big matter now. People visiting your sites most of them are now using mobile. So the theme is designed like it’s fully suitable for any platform. Social sharing with instagram and twitter social widget is possible. A good number of shortcodes and widgets are available on the theme. Also providing good plugins with 2 plugins of value $25. Theme authority provides a good support for any of your problem. So Cortex should be a dream theme for any freelance or agency worker. 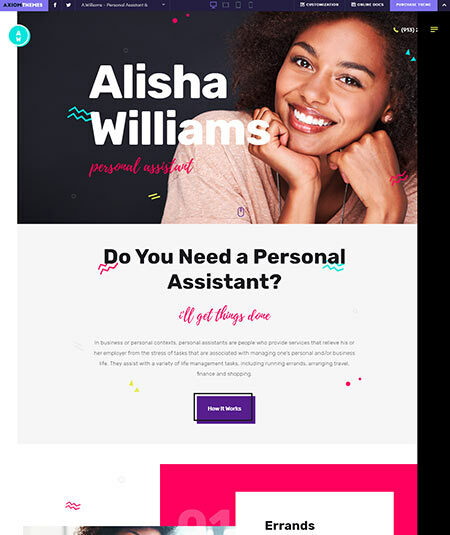 An amazing wordpress theme Reka that can be used for multipursope such for the freelancers, consulting, businessmen and for other for their personal or professional website. 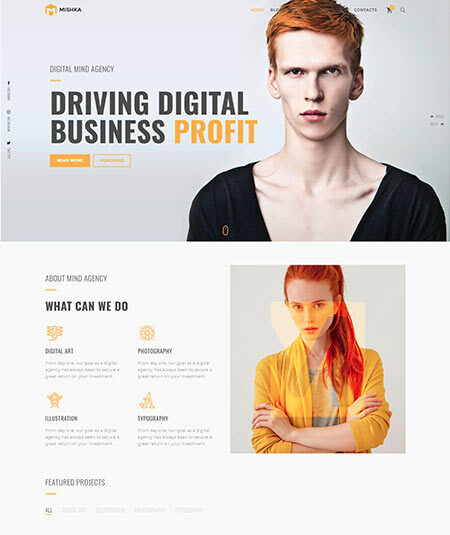 This side menu wordpress theme gives a very impressive support and guidance. They are 24 hours active for the users. The included 67 useful shortcodes for the users. The theme is built with HTML5 and CSS3 valid code. The theme is designed for all sorts of scenes. If a theme is not well suitable for a phone then it has no value now. 6 home pages are pre-designed and an attractive photo gallery is also there to attract the customer. 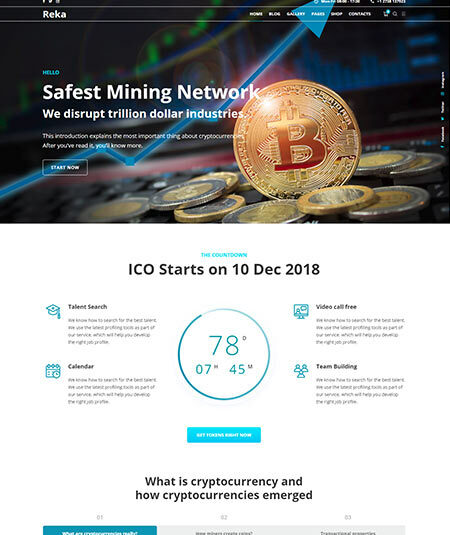 The theme is also a very good one for cryptocurrency. Woocommerce system let the users create a shop page on their website. Some cool features are also added for the users. So undoubtedly Reka is the best choice for a business site. If you are a photographer and about to create your own website about photography then Novo comes for you with a perfect photography theme. The theme gives lot of advantages to the users. A gallery is a big fact of a photography page. Novo has different gorgeous galleries where you can show all your unique and wishing photo with different styles. The theme has a powerful theme panel as well. This wordpress sidebar menu theme has 6 home pages which are pre-designed for the users. Also, they have planned for 3 more attractive home pages to create in the future. The theme is very fast and the very easy to use. The theme is SEO optimized as well. Color management system is very attractive besides this left menu wordpress theme is built with HTML5 and CSS3 valid code. Advanced supporting team is always ready to help the users. So this is the best photography theme for you. 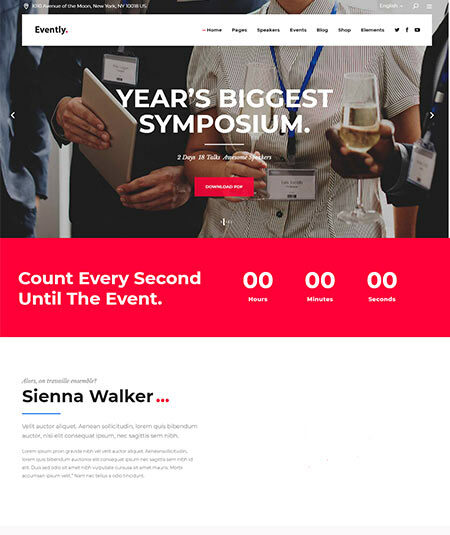 Evently is a multipurpose wordpress theme especially for event and conference. There are 9 homepages layouts that are really attractive and liked by all the visitors. At present any theme is useless if it’s not supporting every platform. This wordpress sidebar menu theme is designed for working on all sorts of devices such as mobile, laptop or on the big desktop screen. The customization system of the theme is very smooth for anyone. With some premium plugins the theme saves extra expenses of the users. Slider revolution of $25, visual composer of $34, time table schedule of $22 is being given for free. The theme also contains a very good gallery. 800+ google fonts are available on the theme. Woocommerce system is also let you create a page on your website. Regular auto updates and a reliable supporting team is also there. So Evently can perform great for your site to promote your business. Lauv comes with a portfolio wordpress theme with 10 unique homepages. The theme is really quick and even the beginners feel comfortable with the theme. Custom 404 is also adjusted to the theme. Different kinds of photo galleries such as grid, mansory, horizontal photo galleries are available that make the website beautiful and attract the visitors. They have minimal black and write protfolio for users. No theme is a theme with a slow loading system. Lauv ensures you a fast loading system. The theme is built with HTML 5 and CSS3 valid code. There is a coming soon page and 2 variants of blogs are also there. After buying the theme one can email the theme authority for any problem. They give a very friendly support and guide to all the users. The theme is fully responsive and also retina ready. So Lauv can be someone’s first choice definitely. If you are going to get engaged or married or having a ceremony next? Jane & Mark comes with one of the best wedding theme for you. With a lot of advantages it is a bestselling theme at the present time. 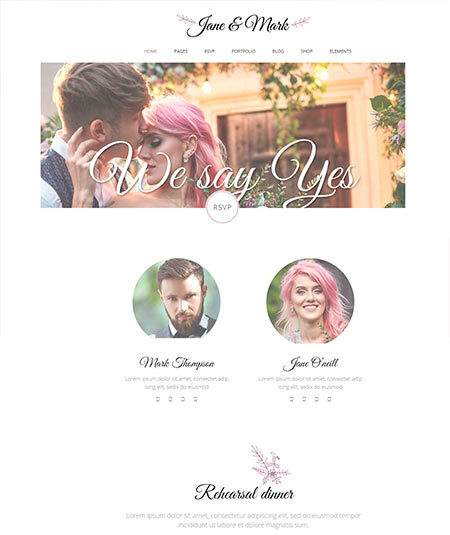 A wedding website requires some stylish layouts, inner page and some other widgets. This theme contains every of them and more. An attractive gallery is also available on the theme where one can show the most beautiful photos. This wordpress theme with vertical menu bar has 3 gorgeous home pages. Users can choose the best one for their wish. And it requires only one click of the mouse to set up all the demos and doesn’t take big times. Also, the theme ensures a fast loading system. Lots of plugins including some premium plugins the theme is really attractive. It is suitable for all sorts of scenes. Practical RSVP form is also added for the confirmation of attending. So for a ceremony based website no other theme is so advantageous like Jane & Mark. 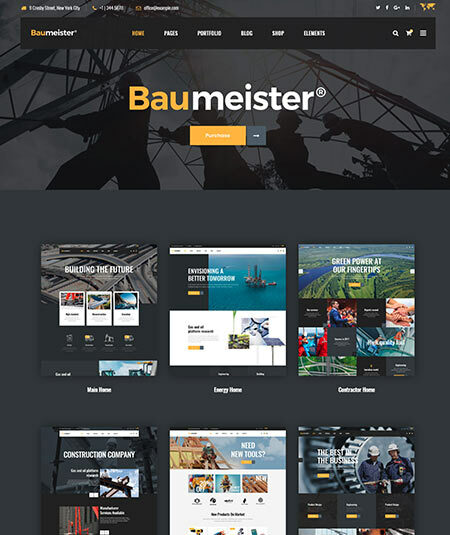 Baumeister is an awesome wordpress theme which is specially built for the industry and manufacturing. The theme requires no coding knowledge to run the theme. Besides, it’s very easy to customize the theme. 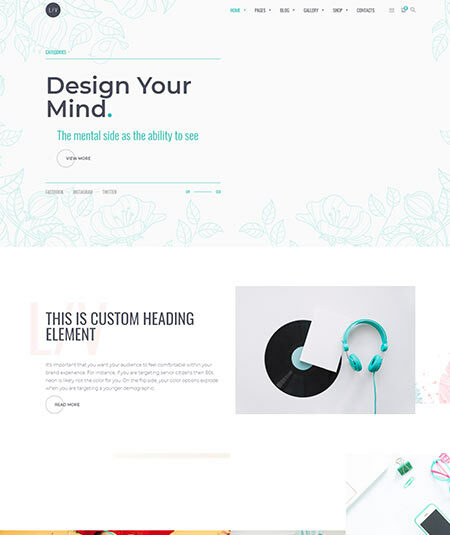 This is one of the best horizontal wordpress themes. The theme is fully responsive with retina ready so you don’t have to worry whether the visitors are from mobile or from other platform. Parallax section and mega menu is also available on the theme. Users can be connected with social sites like twitter or instagram. There are also a huge number of shortcodes. A child theme is included and WPML plugin is also available there on the theme. If you like to have a shop business then there is a good news that you can make a shop page using woocommerce. They are also providing lots of features. So don’t worry about theme where there is Baumeister. 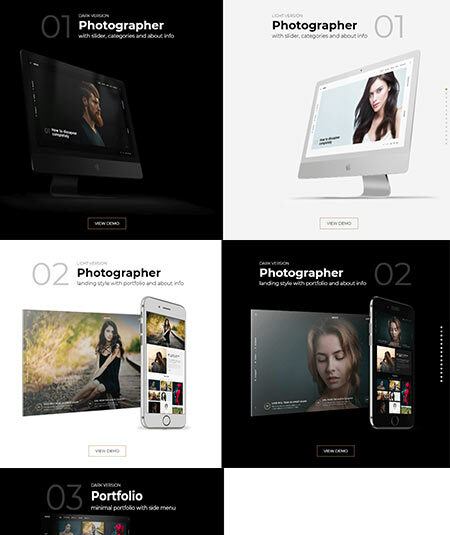 Mishka comes with an amazing portfolio wordpress theme. The photographer, blogger, photo studio companies can use this theme. The theme is specially created for this purposes. 6 attractive homepages are enough to fulfill someone’s demand and they are working for 3 more extra home pages. This side menu wordpress theme gives a very reliable support to the users and they are very friendly with them. Everyone wants to set up a shop page and run a side business. Mishka allows you to do this. One can sell a product on their website using the woocommerce plugin. Full-screen blog and custom 404 features are also available in the theme. The most wanted plugins and features are added to the theme. Also, it can be used in every platform such as phone, laptop or desktop. Auto update is also provided regularly. So try this one of the best horizontal wordpress themes.